I have always loved Children’s Toys. From my earliest memories of playing with toys until today as a proud Grandma toys have fascinated me. When I was a little girl the excitement of receiving a new toy was almost overwhelming. My memory of those days is one of many dolls complete with cradles, doll carriages, doll blankets and doll clothes. When my own children (a boy and a girl) were young we had many toys and games in our home. My husband’s father was a train buff and he built an elaborate train layout for them. It was one of my daughter’s favorite playthings. We were always very fond of Fisher Price toys and had the Fisher Price airport, the Fisher Price garage, the Fisher Price telephone, and the fisher Price bus, just to mention a few of them. I am now delighted to have five wonderful young grandchildren. 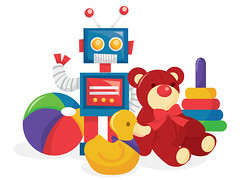 It is fun to be exploring all the new toys that are suitable for their age groups., There are so many wonderful toys and games available that I find I have to restrain myself from buying them all. In this blog I hope to review the many toys we own and the many toys that we would love to own. I will also be searching the web for the Best deals in Toy buying. For popular toys often the best deal is that they are in stock and can be delivered on time. For toys to be acceptable in my view they must be durable, provide some educational value, be suitable for the age of the child, have lasting attention getting qualities, and they must be fun. I will start by review toy brands that we are particularly fond. However we welcome your comments and participation. If you have a toy or toys you would like to recommend or you would like us to explore these toys for you please join us in this journey.